Did you know that we’re now on Periscope? You don’t want to miss us live streaming from Italy this week. Follow us there @ClubThrifty! While we’re away, here’s a great piece from guest contributor Kristi. Enjoy! Cheapskate, tightwad, miser, and scrooge… chances are that you’ve tossed one of those terms around as a moniker for either yourself or someone else. Did you really mean it though? Cheapskates have bad reputations for good reason: they will cross over morally gray areas in the name of saving a buck. What about frugal, economical, prudent, or careful? Do any of those terms come to mind when you’re discussing your spending habits or the spending habits of others? Frugal spenders tend to get unfairly lumped into the same category as cheapskates, even when they’re typically just goal oriented and passionate about saving money for big purchases or to get out of debt. The truth is that there is a fine line between being cheap and being frugal. How can you be sure your living your life prudently without turning into a Scrooge? The key is knowing the difference, and guiding your actions accordingly. A frugal person can sometimes be a bit of self-proclaimed “tightwad.” It’s usually only in the name of maximizing their income though. Frugal tightwads save their money so that they can spend it on more valuable goals and experiences down the road. Cheap people don’t always have any clearly defined goals as to why they’re saving money. They just hate spending money at all. The less they can spend the better. Frugal people, on the other hand, have chosen to live a life of conscientious, goal-oriented spending. Frugality isn’t about saving money at all costs. It’s about saving money on the things that don’t matter so that you can spend your money on the things that do matter. Being frugal is awesome, because frugality is tool to help you prioritize your spending. Frugality helps you to reach your long-term goals. Being cheap just saves you money today. Frugal people aren’t willing to compromise on quality. If they want to buy something nice, they save for it. Quality doesn’t matter as much to a cheap person. They will buy second-rate items all in the name of saving a buck, or they’ll do what they can to get the quality item for very little. Cheap people only care about the bottom line, not the quality or value of something. The number they spend needs to be as close to zero as possible, whether or not they actually care about the item. It all boils down to what an item costs, not what the value is. Frugal people do care about the value of the things they buy. They’re willing to save their money on other less valuable things, so that they can afford to spend their money on the things that are most important to them. For example, frugal people are more likely to be seen driving a new car instead of clunker, or building a dream house instead of living in a trailer home. A cheap person will find a way to dishonestly get a service for free, with things like black market products, illegal devices, and pirating. A frugal person will either just stop using a product in order to save money, or they will wait until they find a good deal so that they can use the product for less. They aren’t willing to steal a product or service in the name of saving money. For example, if you have decided to stop paying for cable so that you can save money, you’re being frugal. If you decide to stop paying for cable, but choose to use an illegal descrambler cable box so that you can get cable for free, you’re a cheapskate. Cheap people will never pass up a free item, whether or not they actually need or want it. Those who are frugal try to get a deal only on things they need or have use for. Frugal people also won’t just take something because they feel entitled to it, or they could “get away with it” without any repercussions. For example, going in to a restaurant and taking ketchup packets when you didn’t buy anything from the store is cheap. Saving the extra ketchup packets that came from your fast food lunch bag and using them later is frugal. Frugal people will sometimes question whether they’re being cheap. Cheap people know they’re cheapskates. It’s OK to walk the line between the two, but you probably don’t want to cross it – unless you don’t care if people perceive you as underhanded or dishonest. Cut out the things you don’t need, stop paying for things you don’t use, and save your money for the bigger picture items or experiences that mean more to you. Just don’t try to save a buck at the expense of someone else. I like being frugal but not cheap. I’ll pay for a TV show on ITunes if I can’t get it at the library or on my subscriptions to Neflix, Hulu, & Amazon Prime. I’m with you! Once I get sucked into a television show, I’m pretty much willing to pay to keep watching it after all of the free avenues have failed. Cheapskates don’t generally take care of their health if it costs money to do so. That’s probably my biggest pet peeve about cheap people. It really backfires when all the little problems roll into a catastrophe and actually ends up costing more over the long run. I hate that as well! Doctor bills cost way more than fruits, vegetables, and vitamins! I totally agree with your definitions of frugal and cheap! However, I’m not sure that the average person would agree. I often shop at thrift stores for my daughters clothing, which I consider to be frugal. However, I’m pretty sure that my mother-in-law thinks it’s cheap. Every time I even mention the thrift store, she finds an excuse to buy our daughter clothes (new from a retail store). It’s kind of annoying, but my daughter is getting new clothes out of the deal so it’s a battle that I’ve chosen not to fight so far. You’re probably right. It’s all in the eyes of the beholder. I view myself as frugal, but other people probably think I’m cheap at times. 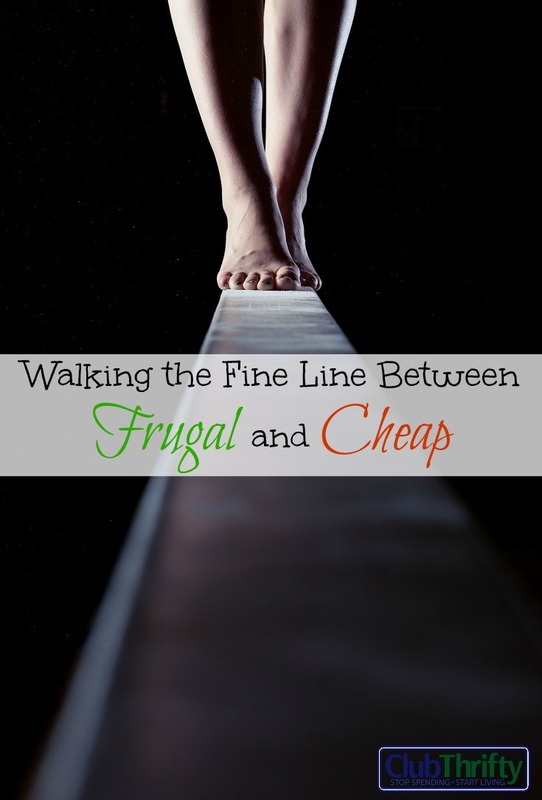 In my experience, people who aren’t frugal or cheap see the two as synonymous. They’re probably too far removed from either to notice the difference. I’m all for being frugal. But I also think it’s important to remember that sometimes you get what you pay for. There are definitely times when quality comes with a price. I think that frugal people are much more likely to skimp on the things that don’t matter as much so that they can buy the nicer, higher quality things in life while still being financially responsible. 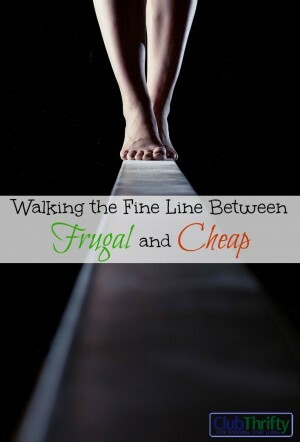 I’m still working toward frugal, but definitely don’t want to cross the line over to cheap. I do think that cheap often leads to “Penny Wise and Pound Foolish”, refusing to spend money on things like teeth cleaning and car maintenance that can turn really expensive over time. That’s a great point! It’s important to only try to save on items that won’t affect long term health or happiness. I joke about being a cheapskate all the time, which is sort of true. My biggest cheapskate moments are deferring purchases long past when I should. This is actually not mostly because I’m cheap though. It’s because I’m lazy. Ha! I have my lazy moments as well, Hannah! I hate it when people mistake the two or use them interchangeably. I like the way you broke down the differences. I think frugality is a positive trait, though not many people in the mainstream see it that way. Being cheap is ultimately looking at the dollar amount, being pennywise and pound foolish or taking advantage of others to save a buck, whereas frugality is about what value. I hate it too when people use the two terms interchangeably. I’m proud of how frugal I can be, but it’s definitely an insult when someone calls me cheap. This exactly defines frugality as far as I’m concerned: “Frugality is about saving on things that don’t matter so you can spend on things that do!” This is the mantra that we live by and, in fact, just yesterday we spent more to purchase a quality bike for our son than we would have for a cheap one at Wal-Mart because this is a purchase that matters to us. His safety and ability to use this bike for a few years was more important to us than just getting the cheapest thing we could find. That’s great, Jen! First real bike purchases are a big deal! I hope he likes it! I think frugal people have a different set of priorities. It’s not just about the money. It’s always about quality of life. I know that if I’m careful with my cash I can make lifestyle choices that would be impossible otherwise. For me, being cheap is about greed. Greed is never good. That’s a great distinction, and I believe you’re right that it boils down to greed. Helpful distinctions and comforting. We are very goal oriented. We are willing to set aside the less important for the more important. So if keeping our food and clothing costs low over several years, just so we can afford to visit Italy again, so be it. I’m with you, Olivia! Anything to travel to Italy again. My favorite place in the world. Yes, there is a distinction between the two. Example of a cheapskate= Always trying to get your friends to carry the majority of the financial burden when getting together. Frugal= Paying your share when getting together with friends. You’re absolutely right! Cheapskates do whatever they can to skip out on a payment. Frugal and cheap are two different words and meaning. I\’m trying to stick to be frugal, but not in the extent that I will become to be cheap. I remember watching that show once. The crazy lady would cut her paper plates in half to use them! I remember shouting at the TV, “Just wash a real plate, lady! Are you crazy?” I never want to reach that kind of crazy. I’d like to stay comfortably in the frugal zone. I like to think that frugal people have a ‘why’ that they are working towards instead of just avoiding spending money. I agree. Frugal people tend to be focus driven with an end goal in mind. Perfect description that draws the clear line between the two paths … being value oriented is not the same as being cheap! This is such a great post that helps people understand the difference between these two worlds. Yes, there are cheap people and cheap people have a different outlook then those that are “frugal”. I take pride in being frugal and I enjoy being able to save in some places in order to spend in others. Especially when having three boys. Thank you so much for this post great information!